Need a quote or information? We're sorry, this product has sold out, there are no plans to re-stock at this time. If you have questions or concerns, please contact Sensorium Embedded. Emulate joystick or keyboard button inputs with external triggers. The USB Trigger allows you to use your own buttons, switches, or relays to simulate joystick button pushes (can also emulate keyboard button pushes - see below) to trigger events on your computer. Converts external triggers into USB joystick button pushes. 24 inputs available, all via a single USB connection to your computer. Works on PC or Mac. No special drivers needed for joystick button emulation. $63.00 USD Sold out, Sorry! Use your own custom button panel to play songs/sounds from your computer. Use relay closures from automated equipment for internet radio control. Use a motion detector to start a web cam. 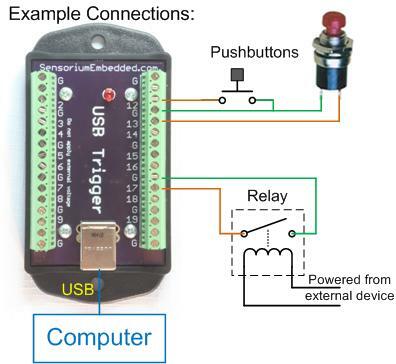 Use a light sensor to launch a home automation application. Use an arcade button or joystick to control your own arcade machine (such as MAME). Make your own custom data entry interface or help for the disabled. In July 2011, Toronto broadcaster Don Andrews contacted Sensorium Embedded via Paul at PJRC. He was tired of hacking mice and joysticks to connect to his radio station control panel to give his on-line radio station a more professional feel. He's been doing radio for 20+ years and wanted to see internet radio control released from the world of keyboard shortcuts and hacked joysticks. By using the USB Trigger, Don interfaced his full button console to his Mac via a single USB connection. He then used USBOverdrive to turn the inputs into key combinations that run MegaSeg Pro DJ and Radio SW for Mac. Have a custom idea you need help with? Sensorium can help you create whatever custom interface you need! Requires USB "A" to "B" cable to connect to your computer. JoytoKey (PC, by JTK Software) Allows external triggers to emulate keystrokes (ex: button push 3 = keystroke 'A'). Easy to use, also good for checking basic functionality. USBOverdrive (Mac, by Alessandro Levi Montalcini) Emulates keystrokes, also has advanced functionality. Preferred by Mac users. AutoHotKey (PC, open-source) Powerful utility to allow a custom action for each USB Trigger input (launch a program, pause/play audio, send a keystroke, etc). JoystickTest Sample script to display button states, good for checking basic functionality. USBTriggerLaunch Custom USB Trigger script by Travis at Sensorium Embedded. Reads/parses all 24 inputs. Ready to customize to do whatever you need, see instructions inside the file. C# Joystick Library by Mark Harris. For C# developers wishing to incorporate USB Triggers as direct inputs to their application, uses Managed DirectX. Uses Windows/Mac default Human Interface Device (HID) game controller/joystick driver. A connection between any channel number and ground tells the computer that a joystick button is being pressed. USB powered - no external voltages should be applied. Pull-up resistors to keep inputs high when switches are off/disconnected. Inputs have series resistive protection (750W). Use normally open buttons drive inputs to common ground (non-isolated). 10mS switch debounce built in. 1 ea $63.00 USD Sold out, Sorry! 10 ea $595.00 USD Sold out, Sorry! To pay via credit card, click "Check out with Paypal" and then "Don't have Paypal Account"